Why is there a need for specialized research or Case Studies in Georgia, specific to how divorce and child custody disputes are handled? 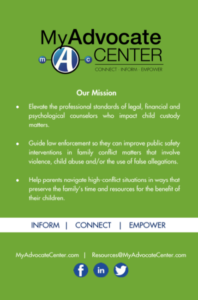 If you haven’t experienced a “high-conflict” and prolonged divorce or child custody dispute, you would have no reason to know what the pitfalls are, what the damages could be, or what really goes on. For certain, it is not like the public generally believes the process should be, or even like other professionals believe either. Other professionals, including most attorneys, are held to their ethical standards, whereas much of what happens in our family court system is not. You may have heard about “ugly” legal matters, and believed that it was a “he-said/she-said” situation, or that somehow the losing party was at fault. You may have thought, “It is not for me to know, to get the details or judge…” so you just leave it alone and move on. You try to show enough sympathy to seem human, but you can’t relate, and you don’t want to experience that person’s shame, torment and suffering. What you don’t realize unless it has happened to you or someone you are close to, is that on far too many cases there is a wide variety of professional misconduct involved…and that this misconduct is what led to the damages. If you are close enough to the case and situation, you may think that “it just didn’t make sense that she lost her children” or “it was wrong that he was accused of something he didn’t do” or “it is NUTS” that one parent was ordered to pay more in child support than they even earn! It is very simple to explain: the professionals who choose to exploit their clients while they are in turmoil and worried about their children and their careers/homes do this intentionally, and they lie and withhold their loyalty in the process. In legal terms, this is explained as breach of fiduciary duty, but in the midst of your case you aren’t aware of what is legal or not legal; it just feels like confusion, shock and betrayal. Like you are being robbed, but you aren’t yet sure by whom, or how or why. Of course, this doesn’t define every single case, and not all professionals, court-appointed experts and judges are behaving badly, but enough are…enough to make for a very “sick” State of Georgia. The purpose of taking the time to thoroughly vet cases, issues, damages, and to also get to know the parties to the litigation is to be able to accurately report on and explain what happened, why it happened and how. This is not just about creating exposure, but about developing tools for education, for recovery and for prevention. By learning through these case studies, litigants can better advocate for themselves and make better hiring decisions, and policy makers can act to help prevent this ongoing assault on our state’s citizens and children. Our case studies once listed will be representative of a much larger number of cases – and victims – which sadly include many children. Studies have been done on actual Georgia cases with more than enough evidence to substantiate these claims, and will touch on a number of issues that bleed into or impact the outcomes of these cases. Professionals who know that other professionals involved in the case are violating ethics rules, or even breaking laws, are not accountable for NOT REPORTING the misconduct. Many take full advantage of this, which exacerbates a “Foul Play is OK if it benefits my bottom line” mentality. Angry, addicted, violent and otherwise dysfunctional parents are enabled and even rewarded for bad behavior. If this misconduct causes the other parent to be reactive, scared and more in need of help from the hired professionals or court-appointed experts, so much the better. More dependency leads to greater fees, and less accountability as the victim will be disabled and unable to discern or take actions. It will involve creating a special section and department within My Advocate Center just to reveal what is happening to litigants once they are depleted, and either have to give up or go forward alone. The Plight of the Pro Se litigant is a nightmare, especially in Family Court. Some parents are dying because of these issues. If the more engaged and nurturing parent is under attack by the other parent, that will be encouraged rather than dealt with according to our laws. If neither party is actually guilty of anything egregious, certain attorneys will coach and guide their client to lie to peace officers or other authorities to put the other party on the defensive, escalating the conflict or causing conflict where none existed. The worst scenario, and one we are sadly seeing often, is where children are being injured, emotionally tormented, and used as pawns to control the other parent. Certain attorneys and custody experts will ensure that children are cut off from the very parent most likely to provide the best care. Parents are rewarded for using their children as financial leverage, while causing duress around settlement agreements involving custody. This is unnecessary and it can be prevented. Beyond the obvious injuries many children are suffering on an ongoing basis – while protection is withheld – more children are suffering silently with emotional neglect, feelings of abandonment, and medical needs that are going UNTREATED. Why would any member of the Court allow children to go untreated even for medical or emotional care, especially when the family has the ability to provide treatment? Please be sitting down for this: Allowing a child to suffer causes the most engaged/connected/nurturing parent to react, to pay desperately to correct the situation & until they are depleted. Depleted parents who suffer along with their children…they do not fare well. They appear “off” to the degree that the offending professionals can wave them off as somehow unworthy…to be discounted and set aside. If you cannot muster empathy for what this feels like for a parent, then put yourself in that child’s shoes, close your eyes…and now imagine that this is YOUR parent you are watching. What is glaringly obvious now is that certain professionals are doing the opposite of what is called for on the cases they manage, because they have learned that nothing will happen to them. It is a part of their Business to make certain that there will be no accountability, and as little transparency as they can dictate. 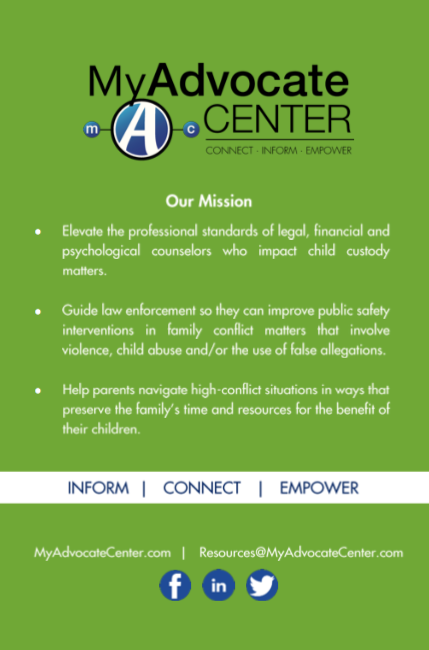 By contrast, you will be able to see that the professionals, experts and counselors we work with do not engage in these activities or cause these damages. This is the difference that My Advocate Center offers. We have carefully studied professional conduct, case management and outcomes to know which professionals will uphold duty and follow the rules and laws. We only work with true Advocates, the kind you would want guarding your children and your interests. Also in contrast with these case studies, we will reveal how we are working with the right teams to turn around cases, so that parents can report success rather than disaster. The more successes we create for good parents, the healthier the children are in our community. Once you understand the patterns that flow from our case studies, you will be able to better discern the truth in your own case, and empower your family members and supporters with the right perspective as they witness how your case is handled by the professionals and the Court.